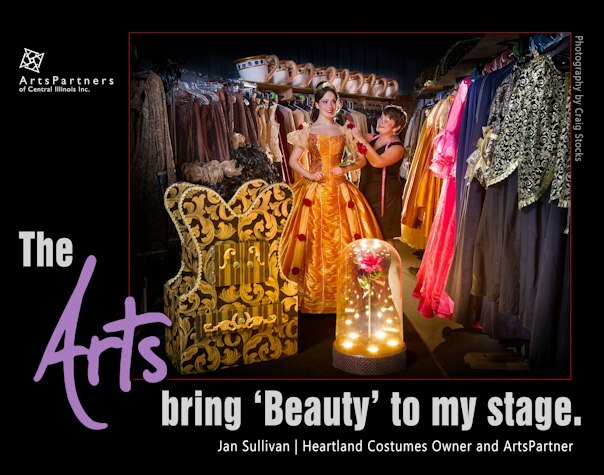 Heartland Costumes was started in 2005 by us– Janet Sullivan and Peter Wentworth. We had both been involved in quite a bit of musical theater, on- and off-stage, and we both had corporate jobs, but we wanted to try something new. We had some money and we had guts. (Too little money and too many guts). We hired local seamstresses and begged and borrowed talent and time from friends and family to assist with our first production in August 2005. Orders came in fast and furious and it wasn’t long before Janet’s garage, dining room, living room, entire basement, and spare bedrooms were taken over by costumes and work areas– everywhere except the master bedroom and bath and kitchen. By early 2006 we had a feeling we were going to be successful, so we decided to take the plunge–, clean up the house, rent one bay of a local warehouse, and get married. On February 03, 2006 we got married quite early in the morning, had a lovely brunch reception, returned tuxedos, and were back at the warehouse by 1 pm.to greet 20 seamstresses who arrived for a “sew-in”. We cut our wedding cake with those 20 ladies (most of whom we did not know). It was definitely an unusual day, but it was an auspicious new start to our personal and professional life together. We are now semi-retired to the northeast coast of Florida where our seaside community was significantly impacted by Hurricane Matthew in 2016 and Irma in 2017. Peter still does the IT work for Heartland Costumes and Janet still works part-time in all the other aspects of the business. We play a lot of music and pickleball, hang with friends and volunteer locally. Kathy has led several lives—all of them interesting. She was an outstanding dancer and taught dance for several years starting at a young age…. taught Junior High civics and economics (winning several awards)…. and was the Executive/Artistic Director of a Community Theatre. Kathy still freelances and has directed “Beauty and the Beast” more times than she cares to count. (Any questions about “Beauty”… Just ask Kathy). Kathy’s three loves are her twenty-something daughter, Whitney, her dog, Leili, and her mom, Lois (not necessarily in that order). Kathy and Lois are lucky to have dinner together almost every evening. 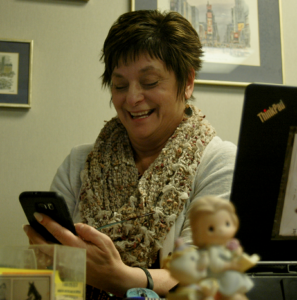 Kathy does our books, invoicing, and all that stuff, and she is really fabulous at taking care of our clients. It’s Kathy on the other end of the computer or phone. When you work with her, you’ll know how lucky we are to have her! We’ve known Kevin for several years as he worked for our veterinarian as a Vet Tech and he also mowed our yard. We knew how smart and what a hard worker he was so when we decided to partially retire, we made him an offer he couldn’t refuse and he joined Heartland Costumes. Kevin’s official title is Shipping Manager, but he is a jack-of-all-trades. He pulls, steams and packs the costumes, and upon return he checks them in and does all non-sewing and simple sewing repairs (he still uses the word “sutures” from his Vet Tech days rather than “stitches”). Kevin does all of the shipping and returns of props and fundraisers. He is full of energy and dedication and we are so fortunate to have him at Heartland Costumes. Kevin still has several clients for whom he mows yards and does snow-blowing. He is head-over-heels in love with his new granddaughter, Thea. We found Leona’s name in 2005 in a Rolodex of seamstress names that our local Joann Fabric kept on their fabric cutting counter. We called Leona and several other seamstresses who were in that Rolodex. Many have worked with us at one time or another, but Leona has been with us from Day 1. We couldn’t have done this without her. Leona built hundreds of our costumes and accessories and does all of the sewing repairs. When she has time, she helps Kevin with packing and returns. The radio in her sewing room is always on and she always sings along, albeit at least an octave or two lower. 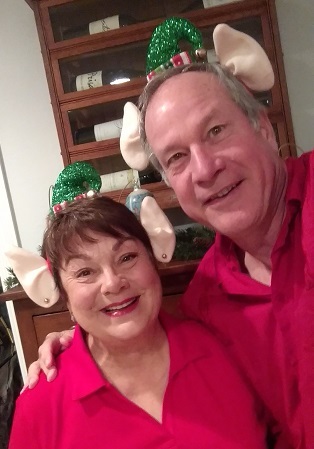 Leona enjoys her grandkids, reading, watching movies and hanging with her best buddy– her dog, Jake.